Where Did We Spend Our Money Last Month? A couple months ago, my wife and I decided it was time to get serious about our personal finances. We have always lived within our means and have never carried any large debt … other than our mortgage. But the problem with living within your means is that it just isn’t enough. At least for our family. So we came up with a plan to start saving over 25% of our income. We knew that we could save at least 20%, but wanted to push ourselves to do better. And in order to consistently save, we needed to be able to see where our money was being spent. So at the end of every month, we download all of our spending transactions from our Personal Capital account. About 99% of our spending is done through credit cards or bank accounts. So Personal Capital is the perfect tool to help with our budgeting and tracking. This monthly exercise has helped us categorize where our money is going. One of the things I like to look at is a high level snapshot of spending categories. Where Did We Spend Our Money in November (2016)? Our ultimate goal is to push our Savings category higher and lower everything else. Here is a high level breakdown of where we spent our money in November. We also keep a more detailed breakdown of these categories … which we won’t discuss today. Oh Yeah! This is exactly what we want to see each month … our savings at the top of the list. I caution that every month probably won’t be so high. But for now, we will take this as a huge win. Saving over 30% of our income seemed impossible just a few months ago. Last week I mentioned that we were able to invest a little over 20% of that savings in November. These investments were made in several different dividend stocks that will start working hard for us earning more income. The remainder of our savings in November went 529 plans for our kids, extra savings to build up some cash, and a bunch of it sent to our brokerage accounts. The money sent to our brokerage accounts will be investing soon I promise you. Our monthly housing spending is probably going to be closer to 25% each month. However, last month one of our furnaces went out! That came with a $600+ service call and bumped our spending for this category up. Besides home maintenance, we are including our mortgage payments along with pool maintenance in this category. Yes, we have a pool and it costs a bunch of money to maintain. I have mixed feeling about our pool to be honest. Finally, we will keep our property taxes and home owners insurance in this category … which we will pay in a couple of months. This may be a higher percentage than the average family, I would assume. And while our food spending is a bit high, I am very cool with that. In fact, I would much rather see our food budget even higher. We don’t spend a bunch of money eating out at restaurants. We do spend extra on healthy, unprocessed foods that just cost more money than processed food-like stuff. Fruits, vegetables, nuts, lean grass-fed meats, and healthy fats make up most of our diet. And unfortunately, these all cost more than food from a box or can. Spending more on food is considered an investment in our family’s health. This “other” category is basically a catch-all for a lot of things. It includes clothing … which we really don’t spend much on. We include gifts in this category as well, which is a bit higher given the holiday season. Things we buy for the kids for school and sports also get included (for now) in this category. It is probably the hardest group to account for and will likely have the most variable costs month to month. Eventually, we may decide to break our spending out more from this group. Our car payment is included in this category, along with gas for our 2 vehicles. My car is paid off, so we only have one car payment. Most days I wish that we only had one car, but that is not possible at this point. We also include car maintenance in this category, which wasn’t too bad in November but can be month to month. Our car insurance will also be included here, which we pay twice per year. This category will include gas, electric, and water payments for our home. Can’t really have a functioning house without them. We are also including other utility like items here. Cable, internet, and home phone make up a decent percentage of costs. Although we have been able to save over $1,000 annually by ditching our cable and opting for streaming services instead. Finally, we have included our cell phone bill in this group. We have 3 cell phones in our house – my wife and I … along with our oldest son. My theory is keep the food spending high and continue to get sleep and exercise … and the medical budget will stay low. This group includes any medical co-pays, prescriptions, eye glasses, … you name it. Our medical expenses will surely rise in the future as our second son will be getting braces later next year. The good news is that our older son will get his off in a couple months and they are completely paid for. Medical expenses will vary throughout the year, but the goal is to keep this category as low as possible. For now, our niche websites (including The Money Sprout) don’t make any income. Hopefully that will all change and at a minimum our 3 sites can become self-sufficient. In the meantime, we need a means to pay for our hosting, domain name renewals, and other web related tools. We currently use Thrive Themes for our WordPress sites … which I highly recommend. These are not free themes, so there is a cost. There are Aweber fees for our email notifications. We also have an upgraded version of Canva in order to create unique images for our web content. I decided to go with the premium version as it helped save time creating similar images in all different formats. More to come on this later. Finally, we are paying an annual fee for Long Tail Pro. This is where we do our research for profitable keywords for our niche websites (other than The Money Sprout). In the future, these expenses should be paid out of our business accounts when we start bringing in some income. Now that we know where our money was spent last month, I wanted to give a quick plug about investing. If you have followed along here on this blog at all, then you probably know that we are not comfortable with putting our savings in a bank account. Now, we do believe in having some sort of emergency fund … and for us it is in several certificates of deposit. But overall, the savings we are working hard for should not be left sitting idle. Savings account rates are an absolute joke and a place we don’t want to keep our money. Instead, we want our money working hard for us. We invest these dollars into our dividend growth portfolio. So almost all of that 30% of savings highlighted earlier is being put to use through the stock market. I am not a huge fan of having a strict budget each month. There are too many variables that go into staying on a budget for my liking. That doesn’t mean however that we don’t care where our money is being spent. We absolutely want to make sure we are not wasting our money. Instead of sticking to strict budget guidelines, we prefer to take care of our most important expense first – that would be our savings. And at least 20% (this month was 30%+) of our income needs to be saved. So instead of having a monthly budget, we try and review our spending after the month is over to see where we can improve. 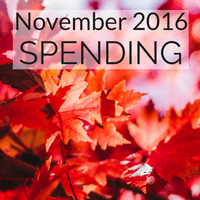 The categories and percentages listed above represent where we spent our money in November. These numbers will help our family make financial decisions for future months to come. Do you track your monthly spending? Have you found areas to improve in your budget from this activity?